Looking for the perfect gift for any occasion? Superbreak vouchers are the perfect alternative for theatre lovers when you can’t decide which show to treat them to. With top West End shows every night of the week you will find you are spoilt for choice when deciding where and when to spend your Superbreak vouchers. Choose from the best West End shows. A great selection of overseas and UK hotels from basic 2* to 5* luxury. All the top shows from the O2 plus comedy, sporting and cultural events across the UK. Ideal for thrill seekers choose breaks including Alton Towers, Chester Zoo and more. The gift vouchers can also be used for golf, spa and attraction breaks providing the recipient with fantastic choices. Offering amazing flexibility the superbreak vouchers are redeemable online and through the superbreak call centre providing a quick and easy booking process. Once you have placed your order here at Theatre Gift Vouchers you will receive a presentation pack and a wallet containing the vouchers. Your recipient will find that making a booking is easy, they just need to choose a break and either enter the voucher numbers online or give the Superbreak Reservations team a call who will make the booking for them. Then all that’s left to do is for them to relax and enjoy their break. 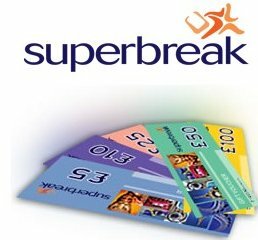 So if you can’t decide the ideal break for them then the Superbreak vouchers are ideal, leaving the choice to the person you are buying for. Prices of examples are subject to change. Gift vouchers are available in denominations of £10, £25, £50 and £100. Vouchers are not available on a sale or return basis and cannot be exchanged for cash or travellers cheques. If the order delivered is incorrect in value/voucher denomination or number, the client must notify Superbreak within three working days of receipt. Non-delivery or suspected non-delivery must be notified as soon as possible. The registered trade marks of Superbreak Mini-Holidays Ltd and its brands may not be adopted by the customer without prior consent. Superbreak Mini-Holidays Ltd can accept no responsibility for vouchers lost or stolen. Gift vouchers cannot be used in conjunction with any other promotional offer or programme. Bookings for travel within 5 days must be guaranteed by a credit card payment which will be refunded to the value of the vouchers upon their receipt at the Superbreak office. Gift vouchers may be transferred from one person to another without restriction, but may not be exchanged for cash, or Travellers Cheques. Gift vouchers may not be exchanged for food, drink, or other services at any hotel. Vouchers may be used as whole or part payment for any Superbreak Mini Holidays hotel reservation. If the value of the booking(s) is less than that of the voucher(s), Superbreak Mini-Holidays Ltd regret no cash refund can be made on any balance unused. If the value of the booking(s) is more than that of the vouchers, the balance must be paid by credit card at the time of booking.